Recommended to: Readers who are looking for dystopian novel that is a little bit different. Imagine if you will the skyline of Manhattan as it crumbles in disrepair. Whole buildings overgrown with creeping vines. Wild animals running through the streets. The chilling sound of your footsteps echoing through the emptiness around you. This is the reality that Kira and her fellow survivors live every day. 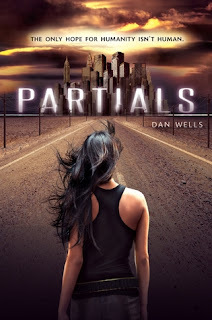 If you are thinking that Partials sounds like a haunting story, you'd be right on track with me. When I first picked up this book I was so excited to dive into the dystopian world that Dan Wells had built. I wanted to get lost in the vast ruins of the New York area. So I settled in, and started to read. Kira's character was really the saving grace of this book for me. In fact, the majority of her fellow compatriots were. Kira is strong, opinionated, and one of the most selfless characters that I've ever met. Kira and her friends don't just sit by and let the government feed them lies, they stand up and do something about it. They of course still make mistakes, which shows the human side of them. These beautifully rendered characters are what brought the story to life for me. In this same vein, I loved the distinct lack of romance in this story. While there are still definitely connections between the characters, they don't overshadow the one goal that is key in this story. Survival. My love affair with Partials didn't actually start until the second half of the book though. I'll be honest, I understood the aim of Dan Wells in the first half of the book. He uses it to build up the desolation of the city, to describe the way that RM works, and to map out the way that the government functions. It's all necessary. Still, it just didn't flow for me. After pages of reading about Kira's findings and scientific jargon related to RM, I was ready to put this book down. Now that I've finished, I'm honestly glad I didn't. Once all of the groundwork is laid, Kira and her rebellion take center stage and things pick up speed quickly. If the pacing had been a little different, I know I would have enjoyed this book much more. At the end of the day, I also still had a lot of unanswered questions about the world in Partials. A few things had loose ends, and the ending felt to me like it came completely out of left field. It is intended to make things more interesting I'm sure, but I'm still not sure how it actually all fits together. On the bright side, this is the first in the series so I'm sure there is more explanation to be had. That's what I'm looking forward to. 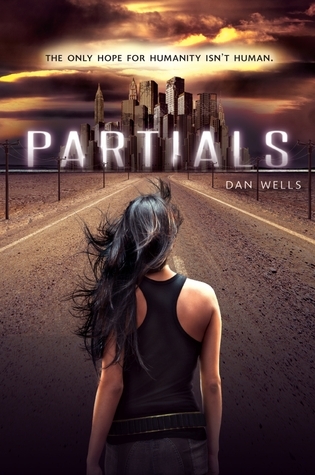 Though this started out slow, I would definitely still recommend Partials as a good first in the series. I'm excited to see what comes next.